Just wondering what people are doing to mount their iPads, powered, out in the semi-open elements. Any recommendations for good mounts? Other tips and suggestions? I don't have an iPad yet but I have a LifeProof case on my iPhone. They are working on an iPad version and they have several different mounting options. I use this one as it has a double ziplock style seal and fold over flap. I have had it on a 14' Hobie cat and it works great. I've been using this home-made mount, based on an old Ram-Mount car phone holder I had from way back in the day. My helm is well protected under most conditions (zip-up the windshield in the rain, and the corner is protected some even when it is open) and I remove the tablet when I leave. I have no case and have used it like this for a year. I don't use it every time I sail, only if going someplace unfamiliar and perhaps poorly marked. Mostly, electronics are not needed, and I have my old plotter; poor res, since I don't have the local charts loaded, but all I need is lon/lat. and speed. 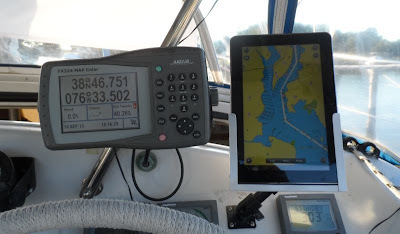 BTW, touch screens are nearly useless in rough conditions. Just so you know. Mostly I use it when prowling shallow (smooth) back creeks, when lots of detail helps. Since the Chesapeake is mostly north/south, I prefer vertical orientation. And now you know exactly where my home slip is!